Short, but sweet--the perfect path for paramours. If the opening of the film doesn't hook you, then nothing else will in regards to this clever and sweet tale of finding unusual success and an unusual love for one man. What starts out as a typical day at work in the john, evolves into a splendidly refreshing take on the corporate ladder, so to speak, while keeping love in its sight. The acting is nicely done, as the characters are enhanced by the folks filling their shoes. Also, the black and white technique adds an element that is hard to pin down, but does enhance the feel and mood of the piece. Perhaps it's the feel of old school romance, and seeing the L.A. area in monochrome tones as well. 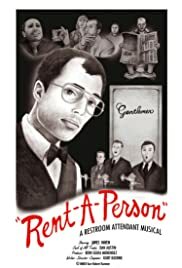 "Rent-A-Person" may only be 15 minutes long, but the catchy commode crooning and James Haven's endearing smile will last much longer in memory... if you can chance to see this film, do take the opportunity.